Cafes and restaurants are the places for relax and recreation, so the most important is their design and atmosphere of comfort, harmony, and uniqueness. So Cafe Design requires great creativity and efforts from the designers. ConceptDraw DIAGRAM software extended with Cafe and Restaurant Floor Plan solution from the Building Plans area of ConceptDraw Solution Park is the most simple way of displaying your Cafe Design ideas and plans first on the computer screen, and then on the paper. Cafe and Restaurant library from the Cafe and Restaurant Floor Plan solution contains 22 vector objects that you can use for quick drawing great-looking Cafe Design. This can be any cafe that you desire - small or large with a few halls, and even with banquet hall, with open area, etc. 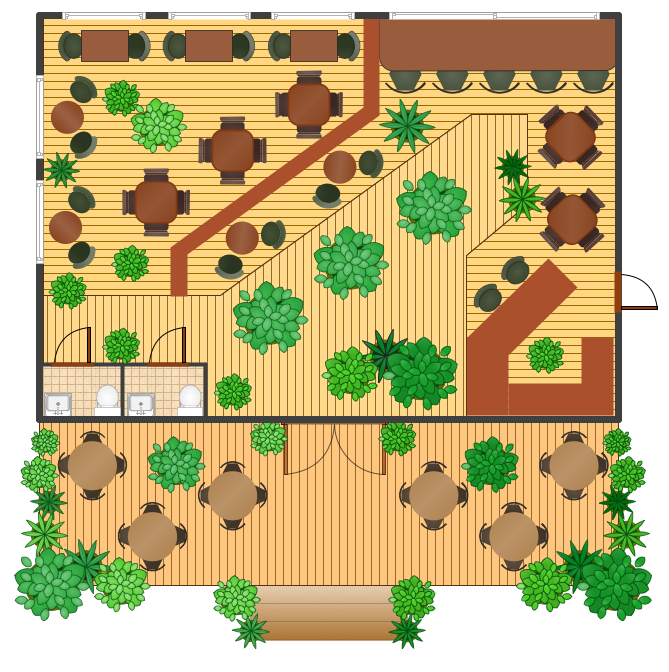 Cafe and Restaurant Floor Plan Solution provides also large quantity of samples and templates allowing anyone create Cafe Design Plan of any complexity in a few minutes. The Cafe Design samples you see on this page were created in ConceptDraw DIAGRAM using the tools of Cafe and Restaurant Floor Plan solution. An experienced user spent 15 minutes creating every of these samples. 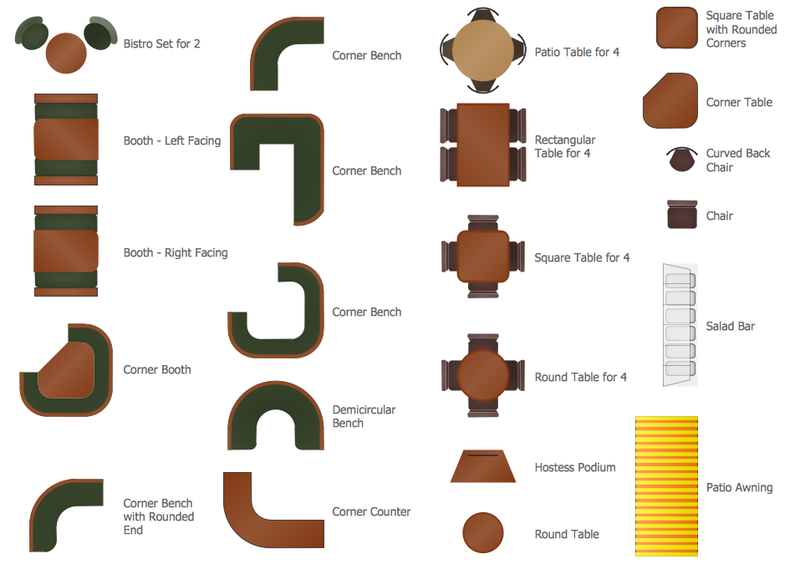 These samples were included in Cafe and Restaurant Floor Plan solution and are available from ConceptDraw STORE. All source documents are vector graphic documents. They are available for reviewing, modifying, or converting to a variety of formats (PDF file, MS PowerPoint, MS Visio, and many other graphic formats) from the ConceptDraw STORE. 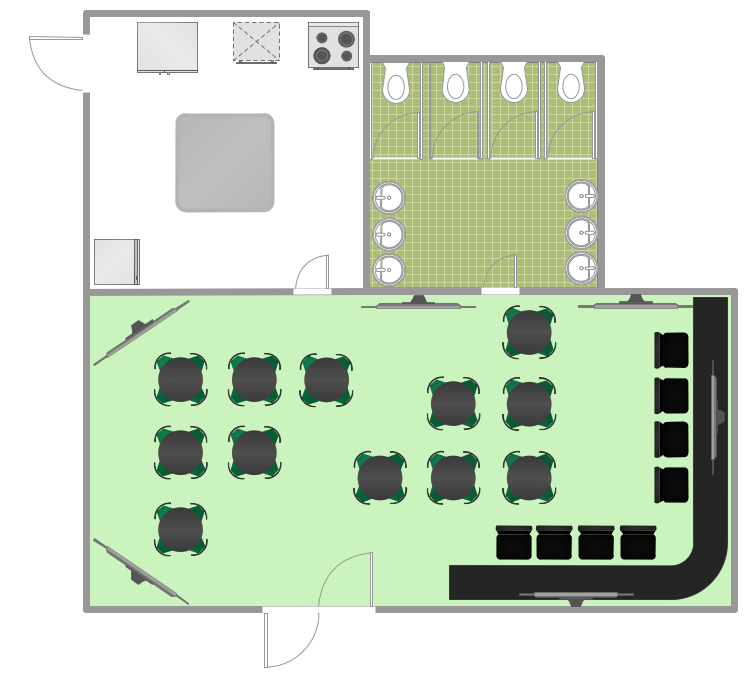 The Cafe and Restaurant Floor Plan Solution is available for all ConceptDraw DIAGRAM or later users. Excellent ideas are the foundation of successful design of cafe, restaurant, bar, and any other premise for working or relax. Sometimes when you need to illustrate your Cafe Design Ideas on the paper or on the computer screen, you may require convenient software. ConceptDraw DIAGRAM v12 extended with Cafe and Restaurant Floor Plan Solution from the Building Plans area is exactly what you need.